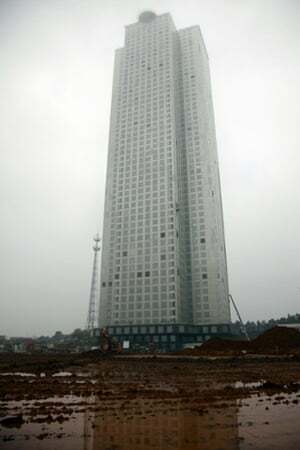 A Chinese construction company is claiming to be the world’s fastest builder after erecting a 57-storey skyscraper in 19 working days in central China. Broad Sustainable Building, a prefab construction firm, put up the rectangular, glass and steel Mini Sky City in the Hunan provincial capital of Changsha, assembling three floors a day using a modular method, the vice-president, Xiao Changgeng, said. The company now has ambitions to assemble the world’s tallest skyscraper, at 220 floors, in only three months. It worked on Mini Sky City in two bursts interrupted by bad weather. Its time-lapse video of the rapid build has become popular on Chinese video sharing sites since it was first uploaded to YouTube. “With the traditional method they have to build a skyscraper brick by brick, but with our method we just need to assemble the blocks,” the company engineer Chen Xiangqian said. Modular methods have been used for high-rise apartment blocks elsewhere, including in Britain and the US. Some critics say the method could lead to cityscapes with overly uniform architecture. Liu Peng, the associate director of the engineering consulting firm Arup Beijing, said the method was worth developing because it could become a safe and reliable way to build skyscrapers quickly. Mini Sky City has 19 atriums, 800 apartments and office space for 4,000 people, with space in the building going on sale in May. The structure is safe and can withstand earthquakes, according to Xiao. Broad Sustainable Building spent four and a half months fabricating the building’s 2,736 modules before construction began. The first 20 floors were completed last year, and the remaining 37 were built from 31 January to 17 February this year, Xiao said. The company is awaiting approval for its 220-floor building, called Sky City, which will also be in Changsha. Copyright © 2015-2019 s4qx46 All Rights Reserved.